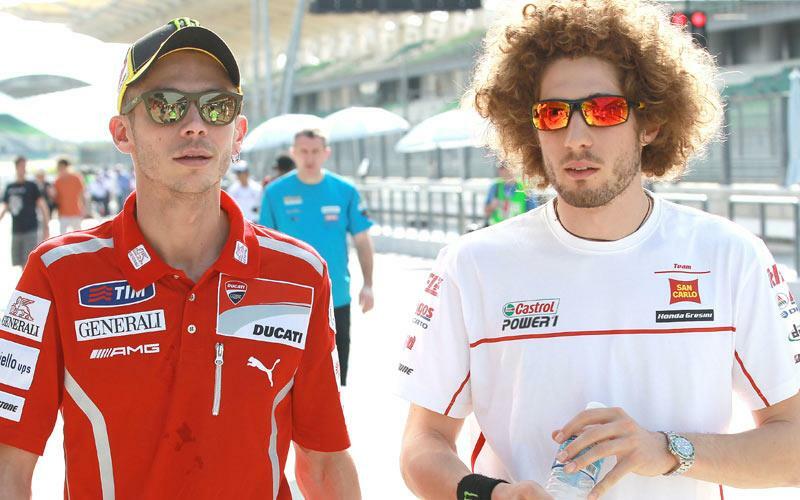 Grief-stricken Valentino Rossi has paid tribute to Marco Simoncelli after the nine-times world champion’s close friend died from multiple injuries sustained in yesterday’s Malaysian MotoGP race at the Sepang circuit. Rossi was caught up in the horrifying accident on the second lap when Simoncelli lost control of his San Carlo Gresini Honda machine at Turn 11. Simoncelli suddenly veered back onto the racing line and Rossi and Colin Edwards had no time to take evasive action. The subsequent collision left Simoncelli with serious head, neck and chest injuries and he was pronounced dead less than an hour after the accident. He is the first rider to die in the MotoGP class since Daijiro Kato lost his life in a crash at his home race at Suzuka at the start of the 2003 world championship. But it is the second time in 13 months that the MotoGP paddock has been plunged into mourning following the death of Japanese Moto2 rider Shoya Tomizawa in Misano. Nobody in the MotoGP field will have felt the pain of Simoncelli’s passing though more than Rossi. The pair were close friends who frequently trained and socialised together and Rossi left Sepang last night too upset to speak in public.